Our theme this month at the UnstampaBelles challenge is Anything Goes Without Stamps, with the optional twist of Use something new you have recently acquired. You need to follow the twist to be considered as the DT Favorite, but you only have to follow main theme to win our prize. I used the Newton's Nook snowglobe die set that I received for Christmas, but I wanted to use it in a different way so I matched it with my koi die from Memory Box. The lighter fish is cut from a shiny yellow paper and inked orange; the darker fish is heat-embossed with a shiny orange powder. I made the sentiment using the fonts 4 My Lover and De Balme Initials. For the fishbowls, I decorated the shiny white paper by inking an embossing folder and gently embossing it. I sprayed the inked portion with a mix of alcohol and water. I used a scrap to create the punched hearts. The shakers are filled with microbeads & orange, heart-shaped sequins. Be sure to check out the fabulous projects by my teammates the UnstampaBelles this month! What a gorgeous colourful card I do like your design and the colours. You are so talented girl! You have such original thoughts . This card is just really cute . Oh brilliant card, love the sentiment works a treat with the Koi fish. 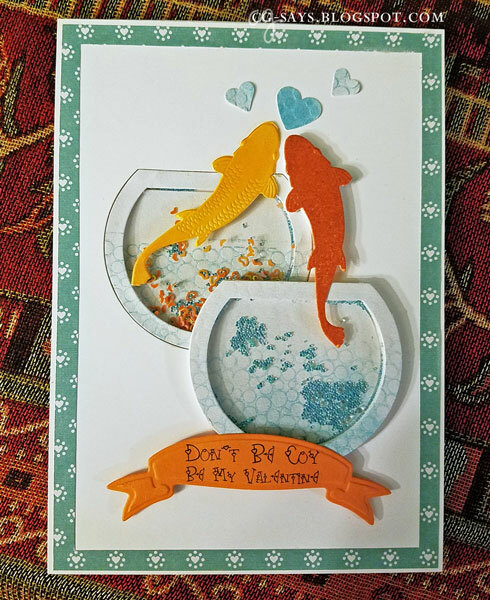 Adorable Koi card! I have some Koi and they are just beautiful fish. Love your design! Thanks for joining us at Happy Little Stampers Anything Goes with Dies! Thank you for taking the time to leave a message. I truly appreciate it, and I will enjoy hopping over to your blog as well.